I often think of the Laughing Halibut, and would recommend it to anyone visiting or living in London. In fact, I like it so much that it features in a key scene in a novel of mine, which is on ice at present but might see the light of day in a couple of years. The scene also features a phlegmatic Italian waiter. The scene (which I have lightly edited, for reasons too complex to explain here) is as follows. Angus Fairfax, the protagonist of the book, is meeting his wife Rosie for lunch. She’d been right. These days, most of our conversations seemed to take place in the Laughing Halibut in Strutton Ground. Strutton Ground was a curious street. Two minutes from New Scotland Yard and five from the Palace of Westminster, it felt as if it had been transplanted whole from the depths of the East End. In low-rise parades of shops, shoe discounters jostled with dodgy cafes. On week-days, hand-drawn barrows materialised on the cobbled carriageway, selling cheap batteries, wet fish, and miracle devices for cleaning both sides of window panes. 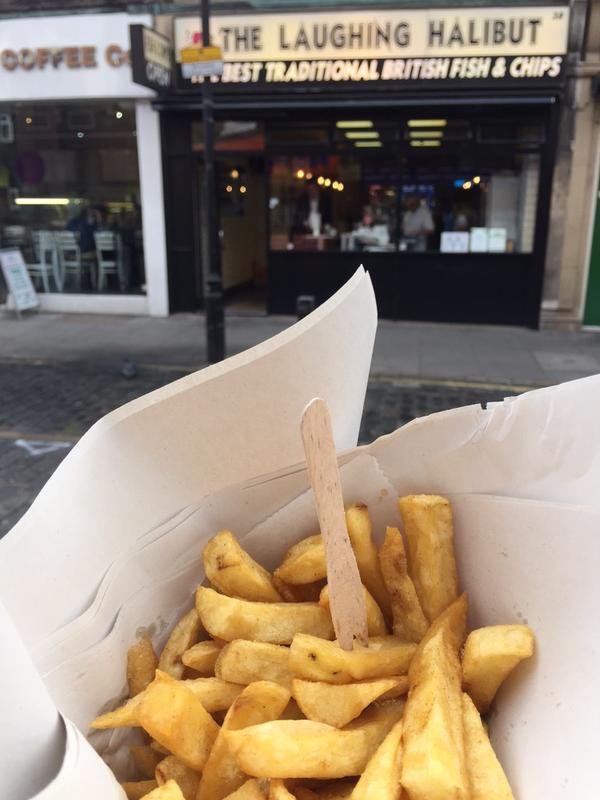 At one end, sandwiched between a bookmaker’s and a charity shop, the Laughing Halibut sold the best fish and chips in central London. I found Rosie sitting at a Formica-topped table reading the Financial Times. It seemed to take her ages to fold the paper away. ‘Have you ordered yet?’ I said. One of the Italian waiters who’d been working in the Laughing Halibut since records began came to take our order. When I said I’d have the battered sausage and chips, ‘because I feel a bit like a battered sausage today’, Rosie didn’t smile. Nor did the waiter. ‘Angus,’ Rosie said. That was all. The waiter dropped two plates of chips and battered objects onto the table. Suddenly I didn’t feel hungry. Something extraordinary was happening. A passing waiter examined our untouched plates. ‘Not yet, thanks.’ Rosie popped a chip in her mouth and smiled up at him as though this were a lunch like any other. I said nothing. It was all true. ‘Thanks very much.’ Inside the batter, my sausage was bright pink. I hope you enjoyed the excerpt. I would welcome your comments, either on the writing or on the restaurant. The Laughing Halibut is at 38 Strutton Ground, Westminster, London SW1P 2HR. If I were reviewing it I’d give it a straight 10/10. By Robert Pimm in Existential - and women, Fiction, Fiction: Novels, Reviews, Robert Pimm on 03/02/2018 . Solche Ehegespräche scheinen in der Ligt zu liegen – die “Wunderübung” läuft im Kino, wo ein mehr als schräger Paartherapeut vergeblich versucht die Ehepaare wieder zu versöhnen. und in den 80er Jahren schrieb Peter Marginter einen Roman”Rettungslos”, wo sich ein Ehepaar gegenseitig sehr gefinkelt ermorden will – jeder auf seine Weise. Der vorliegende Text ist sehr realistisch – selbstbewusste erfolgreiche Frau und ein in seiner Rolle als Mann verunsicherter Ehegespons. Kann heiter werden – bin sehr neugierig. Ja, die Geschichte ist eine Schöne!